The Russian equestrian team had a disappointing showing at the 2012 London Games. Russia’s leading equestrian, Inessa Poturaeva, hopes Russia can make a comeback in the sport at the 2016 Games in Rio de Janeiro. 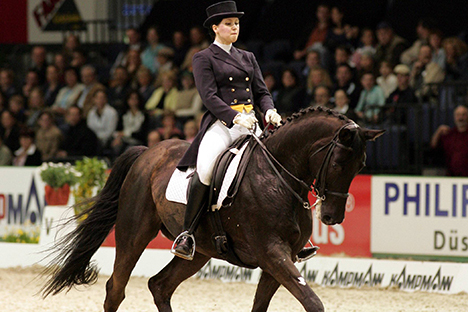 Russia’s leading equestrian, Inessa Poturaeva, is a multi-time national champion, winner of the Central European League World Cup, a multi-time participant in the equestrian World Cup finals and the recently appointed head coach of the Russian dressage team. Inessa Poturaeva: If you don’t count the Moscow Olympics in 1980, Russian hasn’t won a medal in equestrianism for 40 years. Before that, we had some really successful riders — champions — we always won or placed at international events. But the quality of equestrianism in our country has dropped since the collapse of the Soviet Union. Many riders left to earn money abroad, and the training of horses suffered as a result. But we’ve seen great progress over the last three years. Equestrian sports facilities are being built and a number of riders are returning to Russia. Even if they’re not competing themselves, they’re working with the next generation. RBTH: You’re the head coach of the Russian dressage team, so you know what you’re talking about. Have you found the recipe for success with your training methods? I.P. : When I started working with the national team, the horses we had were nothing special. So I decided to retire the older horses and bring in some new blood. Soviet equestrians have been taking part in the Olympics since 1952. Sergei Filatov and his horse,Absent, won gold at the 1960 Games in Rome. Ivan Kizimov repeated his compatriot’s success in 1968, and went one better four years later, taking gold in the team dressage. At the Moscow Games in 1980, the Soviet equestrian team won three gold medals, three silvers and two bronzes. It wasn’t a popular decision; there were lots of discussions, finger-pointing and questions being asked. How could I tell, for example, that a certain horse would be fit for international competition in the future, while another just wasn’t up to scratch? But I have to say that I was right. The horses have already started placing. It was necessary to break with the old, flawed system. If you want to represent Russia, then you need a decent horse. RBTH: So far, we’ve only been talking about the horses. Are the riders a secondary consideration? I.P. : It’s an even split. It depends just as much on the rider as it does on the horse. I.P. : Right. Individually, the horse and the rider may be amazing, but if they don’t reach a level of mutual understanding, then it simply won’t work. It’s such a great feeling when the animal starts to understand, starts communicating with you — all you have to do is listen. There are some really intelligent horses out there: They already know what to do before you’ve even had a chance to give a command, like they’re listening to your thoughts. You can’t win an Olympic gold if you don’t have one of these horses. RBTH: Besides your preparations for the Olympic Games, you are also involved in the Galloping to Rio de Janeiro project for amateur horse riders. How did that idea come about? I.P. : Russian actors and celebrities have taken part in a number of different projects — ice-skating events, dancing events and circus events. Now it’s the turn of equestrianism. I was a bit nervous at first, but it turns out that actors are very motivated and hard-working. I think the project was a success. When we were getting the show together, we wanted people to realize that equestrianism is beautiful, that it is more than just a sport — it is something that brings pleasure and enjoyment. Judging by our Facebook page, where we’re getting 15,000 views per week, it seems to be working. I also get calls from people in the Netherlands, the United States and Germany who are keeping an eye on the project. They love it. A prestigious school in France has even invited our celebrities over to give a master class. RBTH: What do Russians think about equestrianism? I.P. : People always tell me that it’s not a popular sport, that nobody goes to watch it. I don’t think that’s the case. The problem is that there’s no advertising; we don’t get any exposure. RBTH: What are our chances at the 2016 Games? Do we need a bit of magic there as well? I.P. : No, we’ve got a real chance. I’m extremely optimistic about how equestrianism is developing right now. It takes 6-7 years to get a horse ready for the Olympics. We need time, but I think we’ll do ourselves proud in Rio. RBTH: And will you be competing in Brazil? I.P. : Dressage is a way of life. I ride more than I walk. Training takes up a lot of my time. Do you know that a runner-up in the equestrian World Cup was 71 years old? I’ll only be 52 by the time the Rio Games are taking place. God willing, I’ll go to a few more games if my health doesn’t let me down.